So great! What was the inspiration for the setting? Hey Christian! Primeapes have that whole martial-arts thing going on, so I was thinking they could be in a nepalese/shao lin sort of temple... and then I found out that there is a giant pagoda forest outside of a shao lin temple in China. Which is AWESOME. So I used that idea and combined it with a sort of east indian inspired ruin... and filled it with Primeapes. Because I'm a grown-up. And grown-ups think about shao lin and pokemon all day, right? Think of it this way. 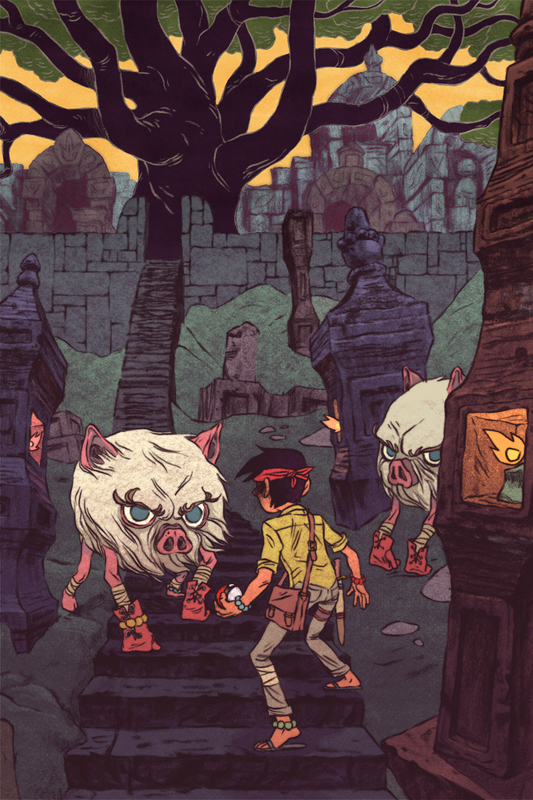 If the Adult Jake Wyatt never made the crazy combination of shao lin and Pokemon, than a lot of people would have missed out on an imaginative and haunting picture. Plus the Pokemon Battle Royale gallery was mentioned on Forbes' website, the epitome of grown-upness. You know, I never did play the games, but now I wish I had! ohh sheewt! I saw this and thought it was awesome before I realized it was yours. I like! also freaky...the "prove your not a robot text" has me spelling syduck. its missing a "p" but that's still sort of awesome right?